A quick & guilt-free breakfast recipe for oatmeal that tastes like banana bread. It’s so easy to make & packed with protein to keep you full all morning long! Throughout high school, I brought a brown bag lunch to school every day because I wanted to enjoy every minute of our half-hour lunch break instead of impatiently waiting in the long line snaking its way around the picnic tables to buy a hot meal, then gobbling up the food in the remaining four minutes before dashing off to class. To ensure my brother and I always packed healthy lunches, Mom purchased plenty of fresh fruit at the grocery store every weekend. Some combination of apples, grapes, oranges, pears, strawberries, and bananas always appeared in the produce drawer or on the counter before Monday morning rolled around. At the start of my senior year, my brother and I tucked apple slices or grapes into our paper bags every day the week before, and we completely forgot about the big bunch of bananas sitting in the corner of the kitchen. Mom pointed them out after returning from her weekend grocery trip, so I pulled our old red cookbook off of the shelf to find something to use them in. I settled on a classic banana bread recipe and began pulling out the measuring cups and mixing bowls. Four bananas and one hour later, tempting aromas wafted through the entire house while the loaf cooled on the counter. 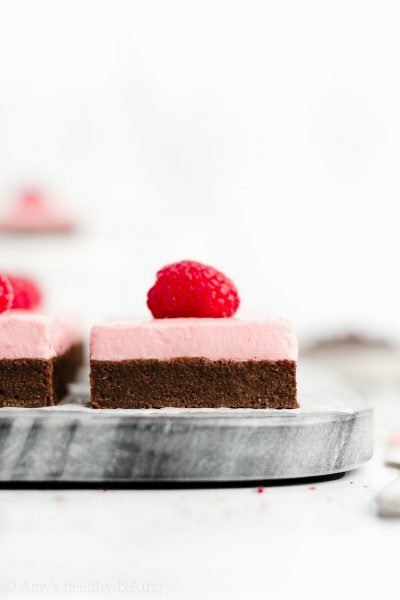 We each cut a small slice for dessert after dinner that night, and throughout all of my classes the following day, all I could think about was nibbling on another piece for my afternoon snack. After sitting in the fridge covered in plastic wrap overnight, the loaf had developed that soft, thin, almost sugary film on top (do you know what I’m talking about?? ), and since that’s my all-time favorite part, I felt obligated to carve off an extra big slice to get as much of that sweet top layer as I could. That loaf barely lasted two days. Because my whole family loved that banana bread, I baked another loaf the week after… And the week after that… And the week after that… I must’ve made banana bread every week for the first two months of the school year! Even now, I still crave banana bread quite often, but it’s hard to justify baking that many loaves without as many people around to help me eat them. 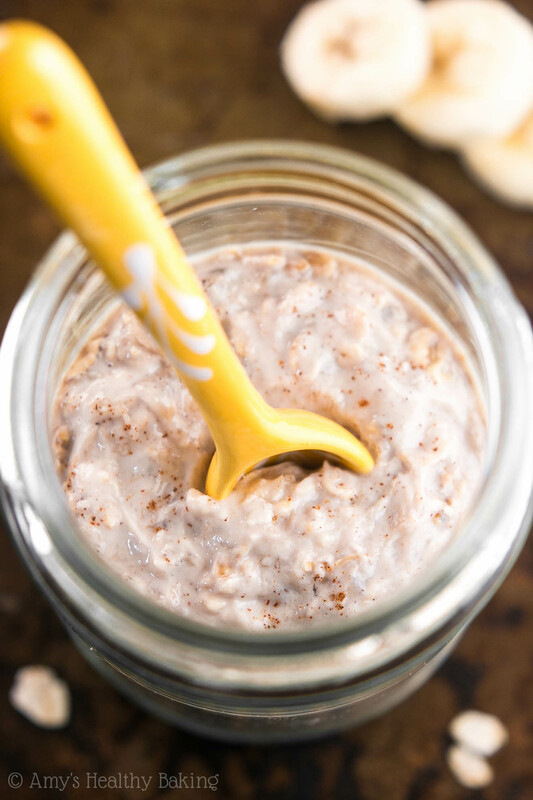 Instead, I compromise with these Banana Bread Protein Overnight Oats! They have the same sweet fruity flavor but yield just one serving… Which is the perfect built-in portion control for me! 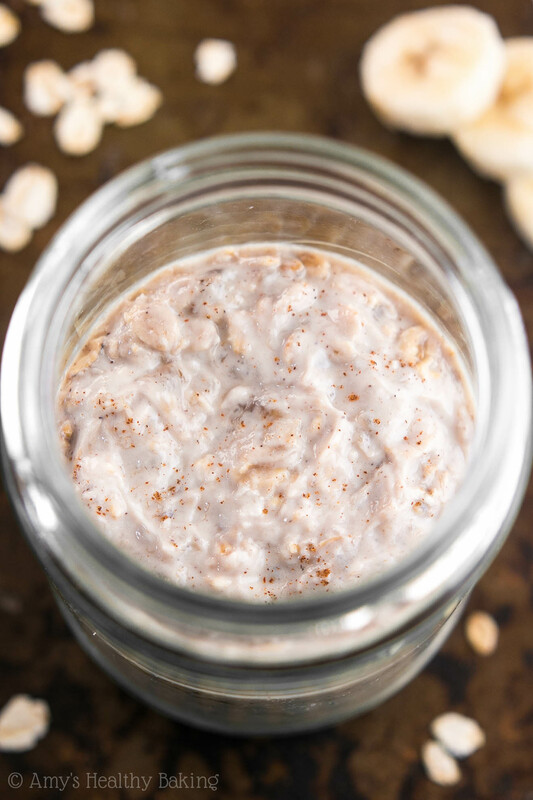 For those of you who haven’t tried any of my overnight oats recipes before, they’re incredibly simple to make! 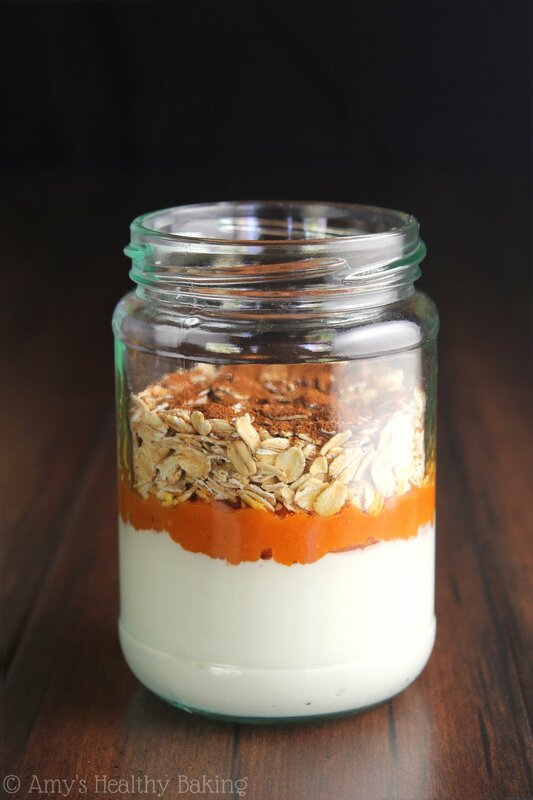 Just mix together the ingredients in a glass jar or tupperware container at night, pop them in the fridge, and your breakfast will be ready as soon as you wake up. Easy peasy! 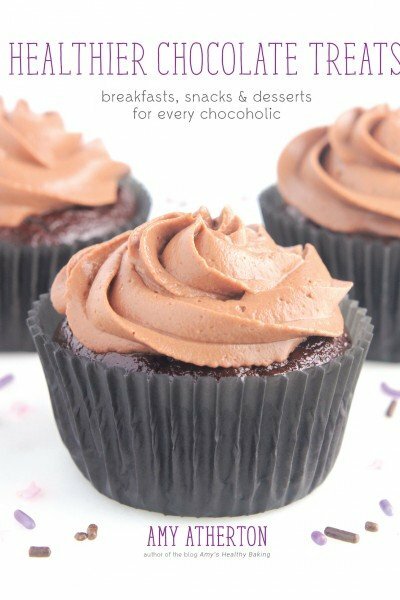 And yes, they are meant to be eaten cold! Letting the oats soak overnight in the other ingredients softens them as much as if you had cooked them on the stove or in the microwave. So just grab a spoon and dig in when you get hungry for breakfast! Both old-fashioned oats and instant oats will work in this recipe, so use whatever you normally keep on hand. 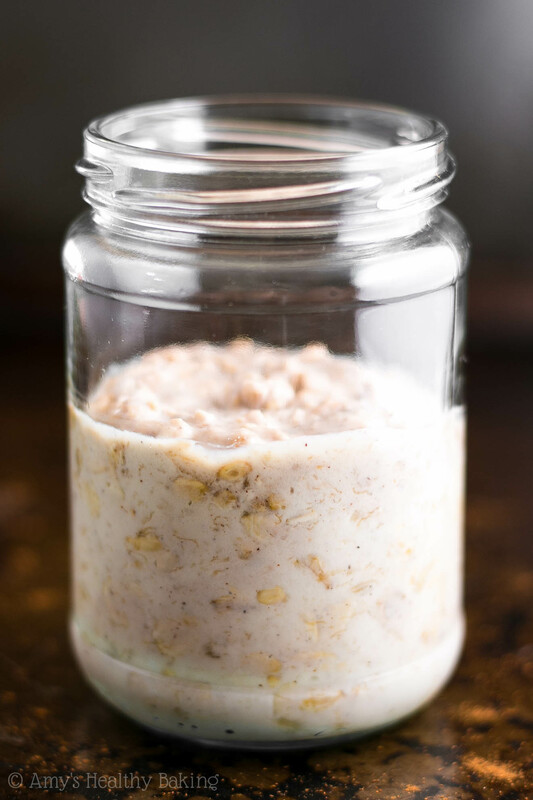 Instant oats are also called quick-cook or one-minute oats, and you can find them in canisters right next to the old-fashioned oats at the grocery store. 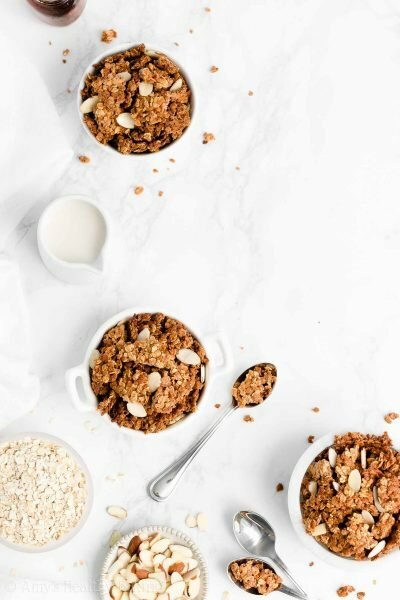 However, do not substitute steel-cut oats; those will not soften enough overnight and will still taste dry in the morning. 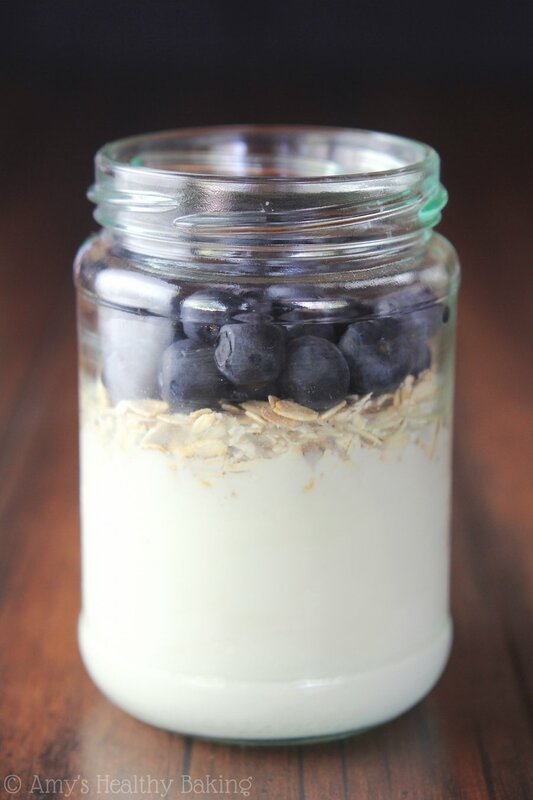 The two “liquid” ingredients that soften the oats are mashed banana and Greek yogurt. Greek yogurt provides the big protein boost in this healthy recipe! It contains around 20g of protein per serving, whereas regular yogurt only has about 8g. I prefer to buy the big tubs and scoop out what I need—that’s much cheaper than buying lots of individual serving cups! Now who’s ready for breakfast? 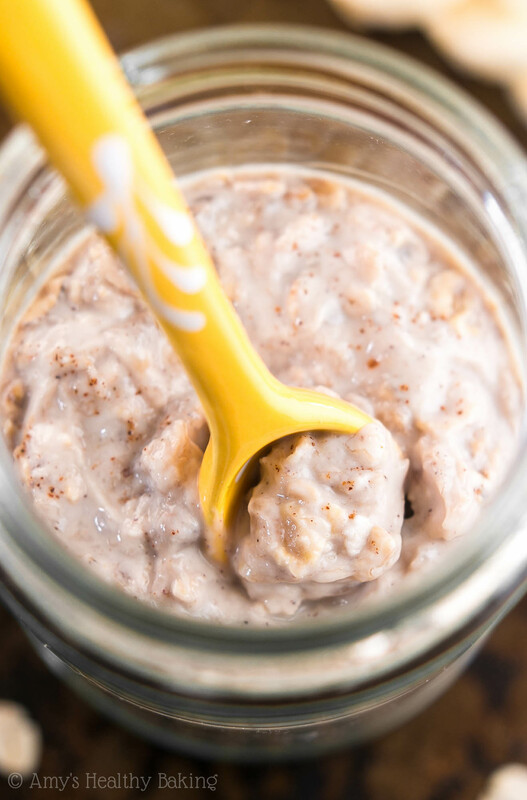 These overnight oats are so easy to make! Plus they’re packed with protein to keep you full all morning long. 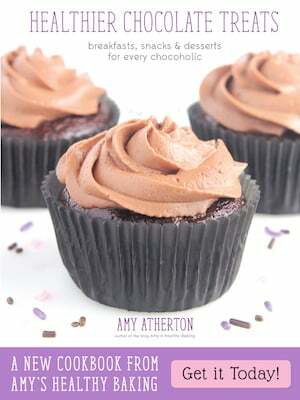 The recipe is easily doubled or tripled to serve more. Add all of the ingredients to a glass jar or tupperware with a tight-fitting lid, and stir until fully combined. Cover and refrigerate for 8 hours or overnight. 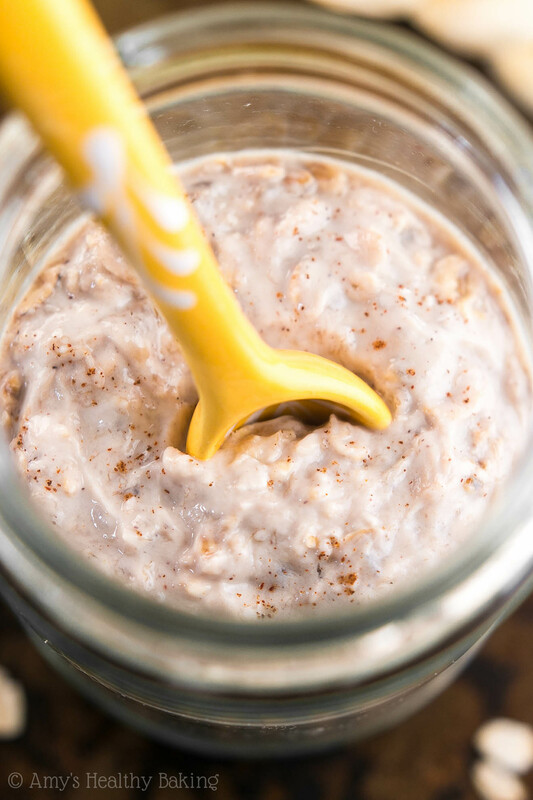 Notes: Overnight oats are meant to be eaten cold, straight from the refrigerator! No need to heat them up. Instant oats (aka quick-cooking or one-minute oats) may be substituted for the old-fashioned oats. Do not substitute steel-cut oats; they do not soften enough. Any sweetener may be substituted for the stevia. If left for longer than 24 hours, the mashed banana will start to turn brown. That’s perfectly fine! It won’t affect the flavor or texture of your oats. 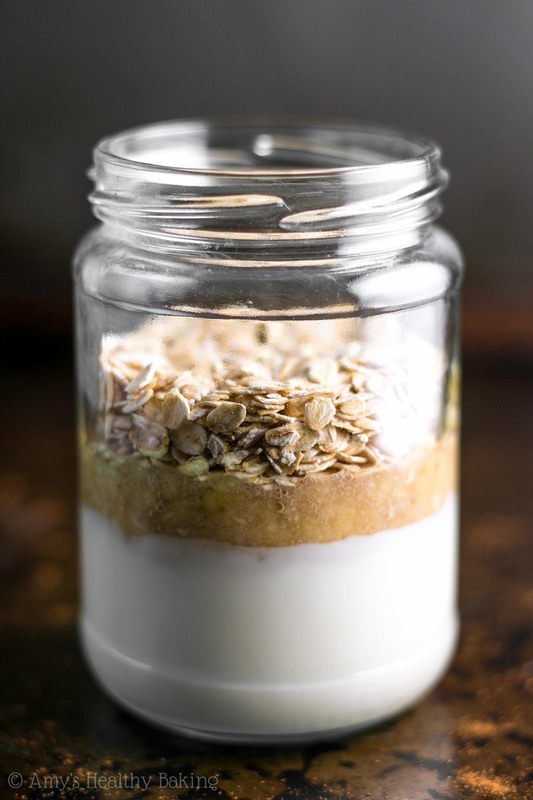 The oats should keep for at least 4 days if stored in an airtight container in the refrigerator. Hi Amy ! I’m new at this “overnight oats” but excited to try them. May I ask if this recipe would still work if I use milk instead of yogurt ? How about rolled oats ? Thanks and I look forward to your reply . I really appreciate your interest in my recipe Elizabeth! 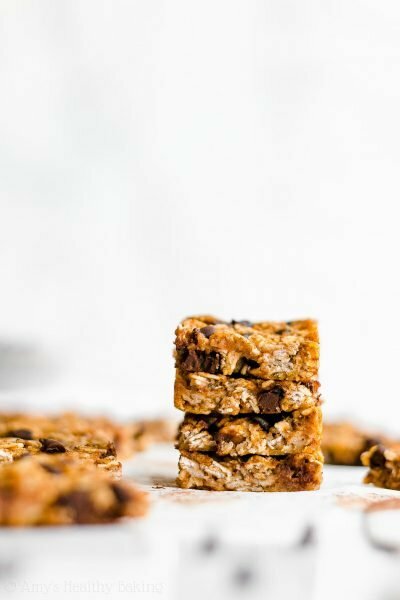 Old fashioned oats and rolled oats are actually the same thing. 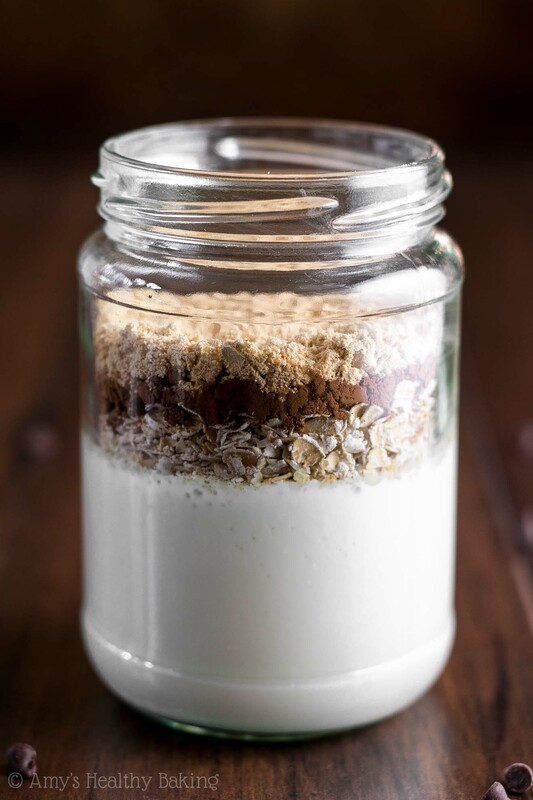 🙂 If you use milk, use half the amount that you would yogurt, but remember that the overnight oats won’t be as thick and will be a little watery instead. 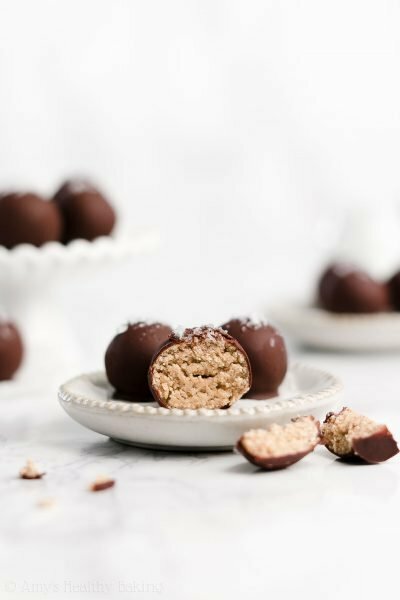 I’d love to hear what you think if you try these! These were so good!!!! I see these becoming a frequent breakfast choice for me!